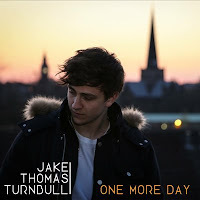 One More Day is the latest single from Jake Thomas Turnbull. It's released on February 12, but the North East singer-songwriter has just revealed the accompanying video to the song, his first since upping sticks and moving to London. It's a beautifully striking and emotional track that reminds us of the best of Stephen Fretwell and Liam Frost's acoustic work and the video reinforces the sentiment of the song. In parts the acoustic guitar is augmented by some subtle strings that add to the aching longing feeling that's expressed in Jake's voice. Jake Thomas Turnbull's official site can be found here. He is also on Twitter and Facebook. The single is launched with a gig at The Timberyard in Soho, London on February 12th. It's just a amazingly attractive plus emotionally charged keep track of this reminds united states of the highest quality with Stephen Fret well plus Liam Frost's traditional deliver the results as well as training video reinforces a message of your songs. Around portions a electric guitar is definitely increased by way of quite a few subdued guitar strings this boost the tenderness ready sense that is definitely mentioned around Jake's express.